Students gather outside the Wisconsin Capitol in protest of the lack of climate change regulations. Photo courtesy of Sydnie Oestreich. Students have provided the voices of democratic change and protest for centuries. Throughout history, these young adults contributed to some of the most monumental revolutions in modern history. The Little Rock Nine, the children of Tinker v Des Moines, and most recently the students of Marjory Stoneman Douglas, all stood their ground and fought for change among not only their communities, but their world. 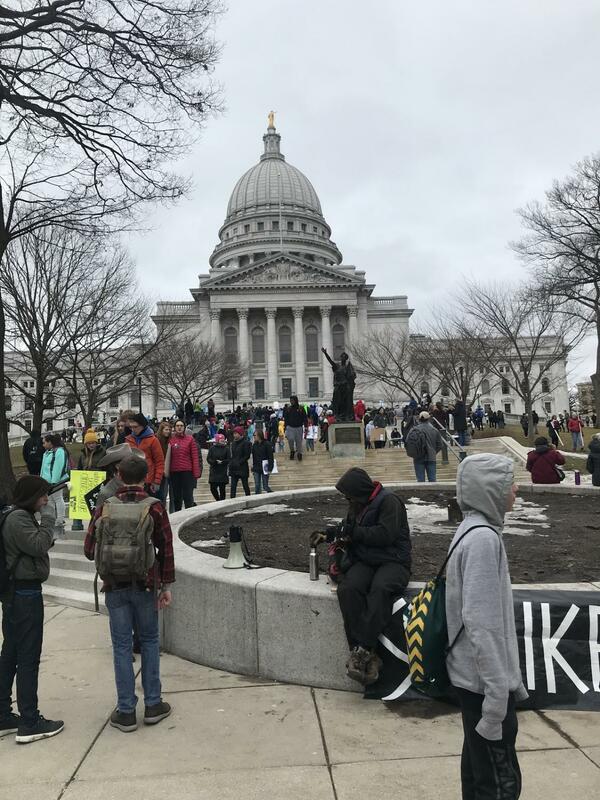 On March 15, 2019, Madison-area students entered this historical trope of students standing for environmental reform, demanding the government to take control and support the Green New Deal proposed by Congress. What the protest demonstrated is the students’ strong opinions and solidarity towards climate change and the crisis that the environment faces. Students rallied in front of East High School at around eleven to march down East Washington Avenue to the steps of the Capitol building. Motives behind the protest included gathering support for Sen. Alexandria Ocasio-Cortez’s proposed Green New Deal, and to demonstrate that they will not compromise on climate change. Across the globe, approximately 1.4 million students protested for the cause. The mass walkout were initiated by Swedish student Greta Thunberg, who would sit out of school every Friday to lobby the Swedish parliament with demands for action towards bettering the planet. Of the 2,052 cities that students actively protested, over one thousand students gathered in Madison. The Wisconsin State Journal reported that “Chants of ‘Let us in’ and ‘We vote next’ echoed throughout the Capitol from protesters assembled outside the locked doors of a foyer leading to Senate Majority Leader Scott Fitzgerald’s office. D.C. Everest High School Pep Band traveled the same day for a field trip to play music inside the Capitol. Senior Brayton Herwig witnessed events of the protest as the Pep Band made their way through the crowd at the Capitol. 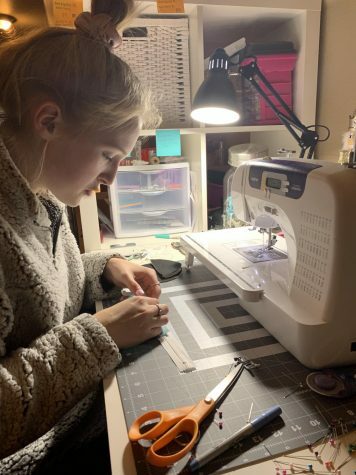 “There was one person on like a megaphone, and they were speaking very inspirationally about climate change and the issues that come with it,” said Herwig. 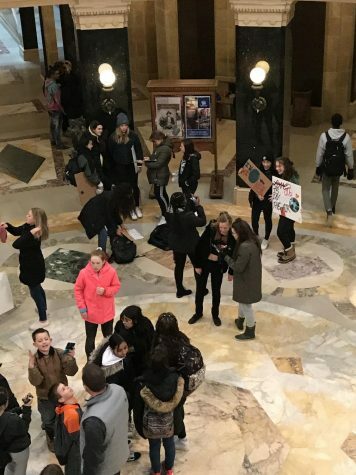 Students with signs saying “CO2 is in the air” and “I’m with Her” with an arrow pointing to a painted Earth, gathered on the floor of the Capitol building. Passion these protestors have for their beliefs is evident, but many wonder if it actually makes a difference.